Well, I could solve the last safe, but what did it buy me? Just another instant-teleport and boom... here I am again! 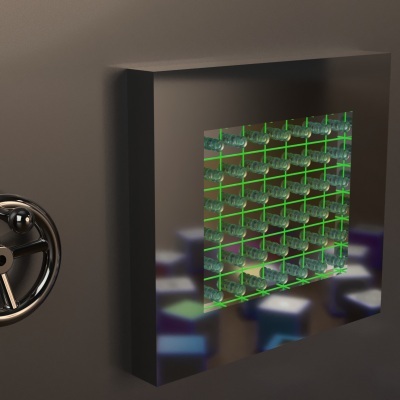 These knobs are made of a glass-like material and when I touch them, there is a sound and they sink into their according square in a sequence: First they go in one third, then two thirds, then three thirds, and if I touch them a fourth time, they come out again. The squares appear like solid metal and are hard on touch, but when the knobs go in, the matching square ripples like mercury. The grid on the display - small grooves - is oddly illuminated. When the buttons go in, it changes in a subtle way. 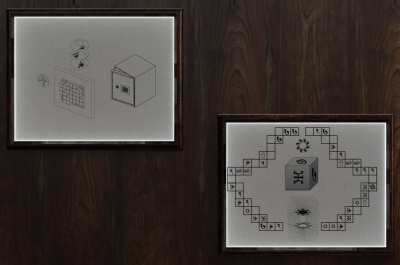 The two drawings are pencil on paper behind glass. 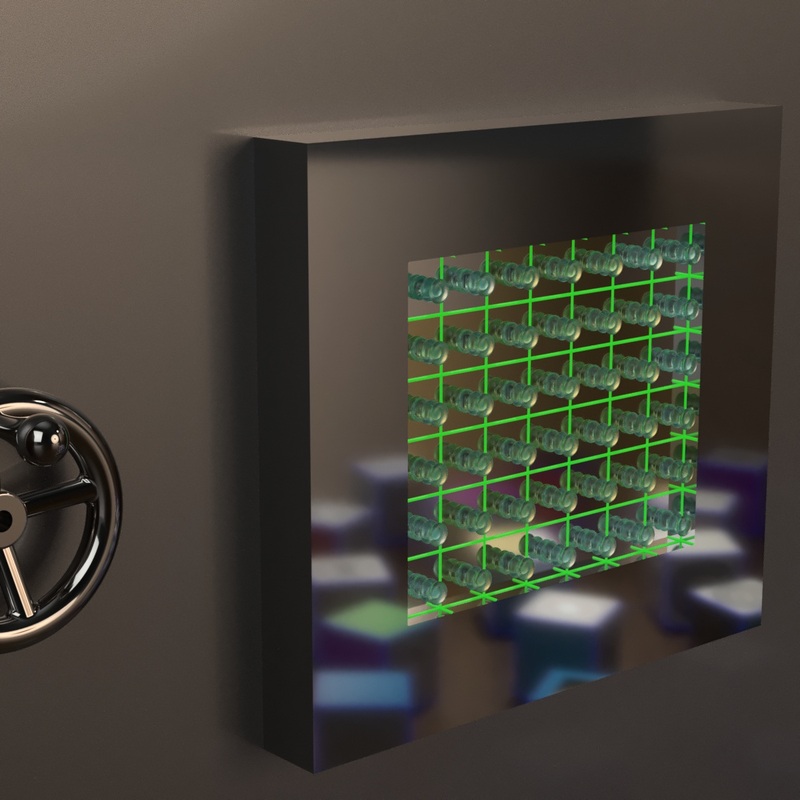 The frame has some light-source under the glass which illuminates the displays. The dice are rather heavy and made of some sort of metal. Different faces are painted differently. I can make out seven colors ( gray, blue, green, red, yellow, pink, black ) and some symbols. The really odd thing is, that I can pick any of them up to investigate and carry around, but the moment I touch one, the others vanish from sight. Just like this. Oh, and the dice are rather big. Definitely bigger than a square on the display. I'm pretty sure that I have to push several of the knobs on the display to one of their 3 positions to get the safe open. But which ones and how exactly? Edit: It now matches the images and uses the labeling in Bobson´s answer below. 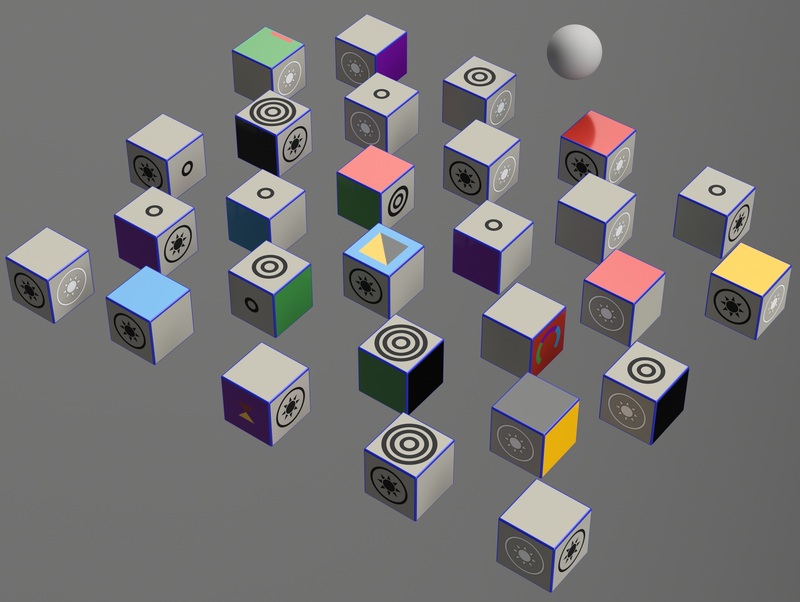 The whole puzzle is about thinking abotu 3D configurations and moves. The stated fact that the 'in-game-you' can not 'pick up more than one die at a time' is just to emphasize the thinking-part and avoid general, unspecific answers like 'I need to put XY dices together to...'. 'in-game-you' can't put dices together like this, but he can think about what would happen if one would put dices together - just like you can (and possibly need to). 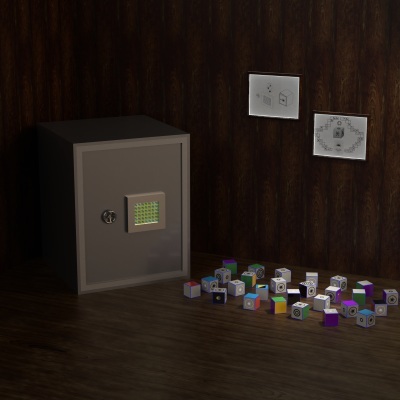 In other words: doing something with the dice can not be the solution, but thinking about doing something with the dice will give you the information needed on what needs doing to open the safe. I've gone through all 27 blocks and noted down what was on each face. The coordinates are counting columns A-I from the top-left to the lower-right of the top view, and top-right to lower-left of the bottom view, and rows from 1-6 from the sphere down. 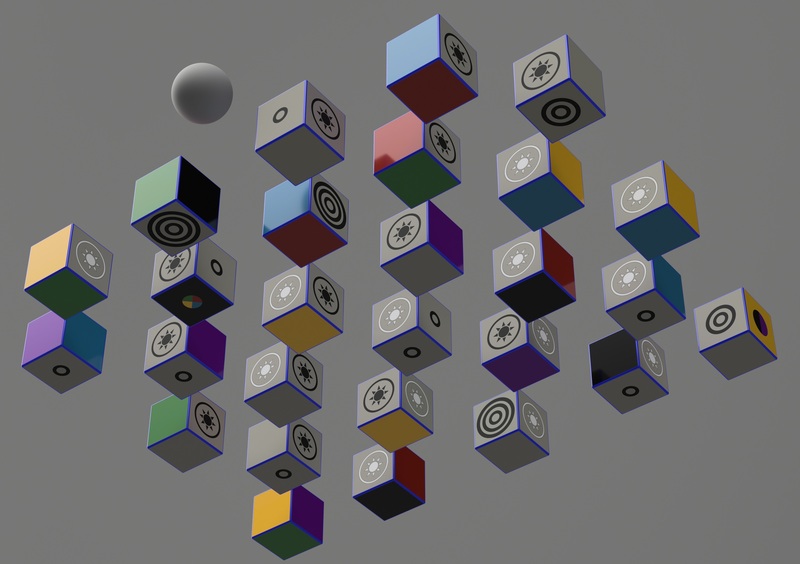 Within each cube, "Top" and "Bottom" are opposite faces, the two "Left" columns are opposite faces, and the two "Right" columns are opposite faces. This is the third version of this, with more colors grouped together by the color coding and colors chosen to match the puzzle. The original version can be found here. I've uploaded my spreadsheet here, as well. Both the image and the spreadsheet are as accurate as I was able to make it, but note that there may be transcription errors, so double check any conclusions you draw. Cube C4 is the only cube without a black sun. Cube D3 is the only cube without a white sun. Seven cubes (A4, D1, E4, E6, G6, H1, H3) have the black and white suns on opposite faces. All the others have them on adjacent faces. Three cubes (B1, G4, I6) have no rings. Six cubes (A2, A6, E4, E6, G2, G4) have unusual markings on one face. There are exactly 8 solid faces of each of the six non-gray colors, and one face of each color which has markings. There are exactly 28 blank faces and 28 faces which have rings at all. Additionally, the 27 cubes correspond to the 27 boxes on each side of the second drawing. Plus, the seven cubes with black and white suns on opposite sides correspond to the seven three-in-a-row sections of the layout. Combining that with the one cube each that only has one sun, I think it's pretty safe to say that the cubes need to be laid out such that each black sun is attached to another cube's white sun, with the two cubes that only have one as the two ends. Presumably, the symbols on the diagram indicate which face should be up on each cube, and the correct layout will tell us something. But I haven't worked out any correspondence there, yet. Not the answer you're looking for? Browse other questions tagged enigmatic-puzzle visual three-dimensional or ask your own question.